Graebert™ GmbH of Berlin, Germany, a pioneer in developing high-performance CAD (computer-aided design) solutions across desktop and mobile devices—today announced the November availability of its next version of its flagship product, ARES™ Commander 2015 2D/3D CAD package on all three desktop operating systems: Apple Mac OS X, Microsoft Windows and Linux. In a separate announcement, the company is also introducing ARES Touch 2015, the world’s first true CAD solution for Google Android, shipping in early 2015 on Android tablet computers. Graebert-developed CAD technologies are used around the world by more than 6 million design and engineering professionals in more than 40 countries in 14 languages through ARES Commander and OEM partner solutions including Dassault Systemes’ popular DraftSight® and CorelCAD (which are both powered by the ARES CAD engine). It’s OEM partners help make it the second largest installed base of CAD software in the global market. 01 – Grabert’s ARES Commander 2015 product line is being introduced today in Germany. The product is a native DWG file based CAD program that runs natively on Mac OS X in addition to Linux and Windows. A key aspect of Grabert’s ARES CAD engine is its native use of the DWG file format, which allows it to interoperate with many of the tools that support AutoCAD® and give the program an instant recognition to users who are familiar with the AutoCAD platform. It is not just a powerful DWG-file compatible CAD that includes 3D as well as 2D but also offers a comprehensive custom programming environment for third-party developers and expert users. ARES Touch for Android — The first DWG-based full CAD software for Android tablets, including a UI/UX specifically adapted for touch-based input. Files are synchronized via Dropbox® or Google Drive™or shared by email. You get ARES Touch for free when you purchase a single-user license of ARES Commander. License ToGO — Use your Product Key to activate your license on another computer and eventually evenunder a different OS (Windows, Mac OS X or Linux) without having to buy a Flex (network) license or even needing to connect to your first computer. The Graebert License ToGo will be active for up to 5 days and you can renew it again on the same PC or another one. As a result, you can use your license from several computers. License ToGo is a service included with the Graebert subscription. Dynamic blocks – Grips editing — Edit dynamic blocks inserted in a DWG drawing by other CAD software such as AutoCAD®. You can use the grips to dynamically and interactively modify these “intelligent” blocks and eventually reinsert them in the drawing. 2D Constraints — Add intelligence to your drawings with the new Constraints Design Solver (CDS) from Spatial Corp. (a Dassault Systemes company) integrated into ARES Commander. Tables edition — Click inside a Table cell or launch the command EditTableCell and you will get a toolbar with all the options to insert, resize, merge or delete cells, rows and columns. Dimension palette — Create or click on a dimension and you will see a contextual toolbar to easily and quickly change its formatting and properties. Advanced in-place text editing — The Notes (MText) command has been improved with a new Paragraph options dialog to define advanced formatting just as you do in a word processor but right inside your drawings. The new Stack dialog helps you create fractions and tolerances in your text. PowerTrim — Trim multiple entities by moving your mouse around – just describe a path with your mouse and ARES will trim while you move. QuickModify — Use only one command to perform multiple actions on the same selection of entities: move, rotate, scale and/or copy without leaving the command. Customizable Ribbon — Customize the tabs and panels of the Ribbon to group the tools you need and like. You may also create your own workspaces. Still, one of the workspaces allows you to switch back to traditional menus and toolbars if you prefer. Esri Powered Online Maps Plugin — Powered by the acclaimed ArcGIS online solution from Esri, this free plugin lets you download geo-referenced images from any address you enter in the search bar. You can also choose satellite images, street maps, topographic maps and more. Linux 64-bit Support — 64-bit distros for Linux include Ubuntu, Debian, Suse Linux and Fedora. A few additional items include a free plugin for Cadenas, which allows users to get instant access to millions of parts from hundreds of manufacturers and insert them as blocks into your DWG drawings. And the new version now supports custom paper sizes for the ARES virtual printers in order to export to PDF, JPG, DWF and other formats. 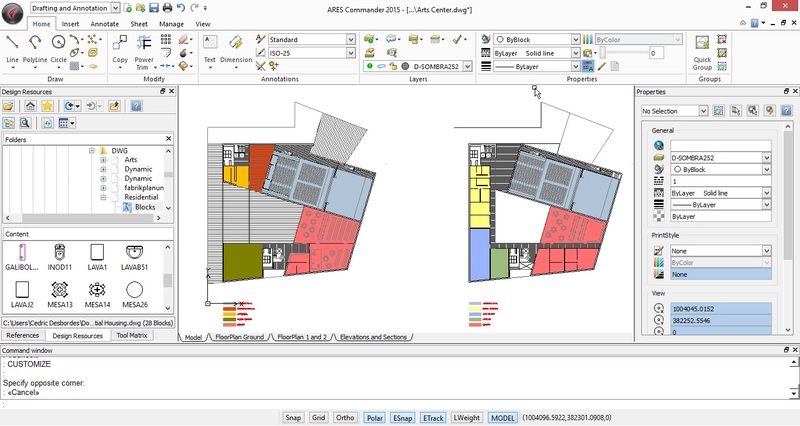 02 – ARES Commander 2015 brings full-featured DWG native 2/3D CAD to all three major platforms and now Android mobile. A full list of features can be found on the Graebert website here. Pricing for a perpetual license of ARES Commander 2015 is 795€ or 795.USD, which includes one year of Graebert Subscription access to obtain upgrades, e-mail support and use License ToGo. Other options include an annual subscription plan at 250€ / 250.USD. A flex licensing option allows to the license to be installed across platforms and shared on any supported OS. 03 – Version 2015 showing its 3D modeling features. 04 – Version 2015’s Ribbon customization options. There are free 30-day trials available for all three supported platforms here, as well as videos on getting started. This is a significant announcement by the German-based global CAD solutions technology company who has a very good strategic relationship with European industrial giant Dassault Systemes—the owners or makers of several leading CAD technology companies including SolidWorks Corporation, Spatial Corporation and its very own CATIA which is the technology behind Gehry Technologies’ Digital Project. Senior Associate Editor for Architosh Pete Evans AIA is in Germany now at the Graebert Annual Meeting where CEO Wilfried Gräbert is speaking to an audience of press and attendees. Two interesting numbers in this announcement include the 6 million users of ARES or ARES-based products, the chief larger one among them being Dassault’s own DraftSight. ARES Commander itself is likely the second largest base of ARES technology-based CAD. The other number is the claim that this number makes ARES the second largest installed base of CAD in the world, obviously behind US-based giant Autodesk. Lastly, it should not be lost on readers that ARES Commander is a native OS X application and that the new GoTo license option that comes with subscription gives users flexibility to install on all three platforms. We’ll comment on the Touch product in a separate report. Mike Laney liked this on Facebook.